Through Ms. Allen-Potter's six years of experience in the classroom as a teacher in San Diego and Fresno Unified School Districts and her close relationships with many educators, she understands that our educators can find themselves struggling with engagement and learning objectives. The need to know how to best assist and support those students in their classrooms, especially those who live with unseen challenges, while maintaining a culture of learning and acceptance in their rooms and on their campus', is imperative for these young adults and their futures. Ms. Allen-Potter has also presented this training at the Cal Ed Conference in Sacramento, CA. for educators. Interested in offering this 60 minute training to your district educators? Send us an email via our contact page. In the state of California, U.L.F. previously satisfied a standard for education curriculum, prior to the Common Core Curriculum standards, geared to prepare a life for success. -Students will engage effectively in a range of discussions (one-on-one, in groups, and teacher led) with diverse partners. This On-Campus Culture Program is where U.L.F. began in 2010. For years this program defined U.L.F. 's mission of teaching compassion and one-ness to our youth before it further expanded its purpose to all other programs. 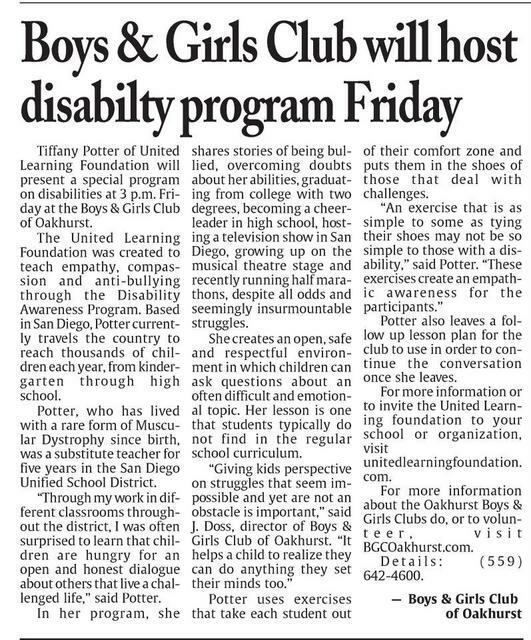 Based on Tiffany Potter's work as a substitute teacher for six years in San Diego Unified School District and the realization, as she worked with new classes, that our children are hungry for someone to speak honestly to them about what it is like to live a challenged life; she decided to offer up her life and experiences as a teaching opportunity. Meeting them at eye level, she shares her stories, discusses the hurts and sadness accompanied with being bullied, teaches them empathy for each other through a simple yet profound activity, allows time for questions and great group discussions, and offers hope and healing through a special 60 minute presentation with each classroom or group. This program continues to be sought-out and we will satisfy all requests for visitation to your campus or organization, wherever you may be. U.L.F. 's On-Campus Culture Program in their schools. bronze medals in U.S. News's Best High Schools rankings." All children struggle the same, whether there are those who stumble through normal daily learning activities or those who have a developmental/cognitive disability. While some students have assistance through their 504's and IEP's, some children go without a diagnosis and a lack of resources. This training program helps educators identify behaviors of challenged learners, and provides practical tools and techniques to aid children into a successful educational career. All while maintaining a culture of learning.